The history of Danube Swabians and the pilgrimage church John Baptist on Mount Bussen is connected in an interesting way. First records of the pilgrimage church on the “holy mountain of upper Swabia” date back to 805. From the 16th century onwards, an admiration of Our Lady of Sorrows is documented. 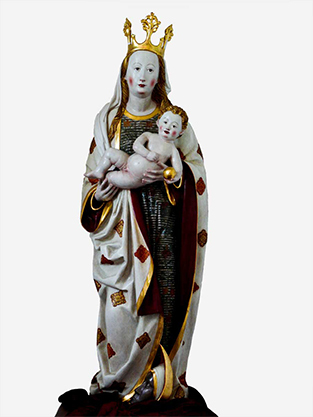 In 2005, on the occasion of the 1.200-year anniversary, a replica of a Statue of Mary from Hajós in Hungary was given to the church. The original statue stood in the church on Mount Bussen until 1712. During a fire in the church the statue could be rescued. In the decades after the fire, a migration wave from the area around Mount Bussen to Hungary began. One of these migrants was Maria Hall. She took the statue with her on her long and arduous journey to Hungary. On the journey, Mary is supposed to have worked wonders. For example, she spared migrants from a certain death in the Danube. These stories are told by the offspring’s of migrants until today. In 1730, a church was built in Hajós and the statue is worshiped there since then. Pope Pius VI declared the church a place of pilgrimage and mercy in 1794. In the 70s of the last century, the people form the area around Mount Bussen and the inhabitants of Hajós came in contact again. 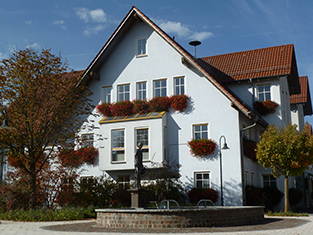 Reciprocal visits were organised and with the replica of the Madonna of Mount Bussen, a symbolic connection has been established between the migrants and their former home. The replica of the statue can be visited in Christ’s Chapel next to Mount Bussen Church. opening hours: daily from 8.30 am to 5/6 pm. Services: Saturday and Sunday at 10 am, a rosary is said before every service.